The extreme, bone-chilling temperatures in Alaska are some of the most demanding conditions possible for a primary containment liner. The extreme, bone-chilling temperatures in Alaska are some of the most demanding conditions possible for a primary containment liner. That's why the Lowell Point Wastewater Treatment Plant in Seward, Alaska, depends on XR-5® geomembrane material produced by Seaman Corporation. 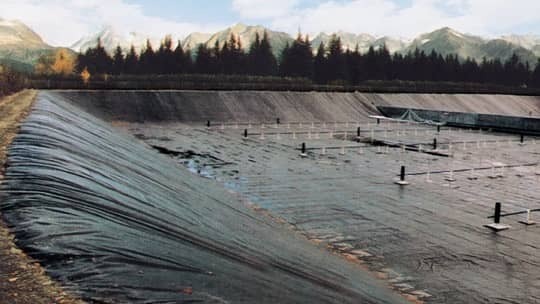 The 250,000 square-foot aerated sewage lagoon was lined with XR-5 in 1991 after a failure of the liner system necessitated a complete redesign. CH2M Hill, the project consulting engineer, specified the Seaman Style 8130 XR-5 geomembrane because of its high strength, low thermal expansion/contraction, chemical resistance, and suitability of exposed application. Furthermore, due to prefabrication of large panels in the shop prior to construction, the primary installation took only three days and required minimal field seaming. In an environment where the weather can change quickly, this was imperative. As can be expected in Alaska, the XR-5 liner is exposed to extreme environmental conditions and constantly fluctuating temperatures. This geomembrane is rugged, strong, and durable enough to withstand the frigid low temperatures and ice build-up as well as the UV radiation and thermal change.